Council Member Smith made the motion to correct the minutes (show why member voted against appropriation $30,000 Edit Fund) seconded by council member Armbrecht. Motion approved by (6) Six members (Armbrecht, Dunbar, Simon, Smith, Nickell & Dramann and (1) abstained (Bauer). Sally Morris; Ripley County Community Foundation updated the council members on the position of the foundation for handling the distribution from the Ripley County Endowment Fund. Morris advised that the Foundation could not distribute the funds per the foundation agreement and also advised that this money be used for charitable purpose as indicated in the endowment fund agreement. When the money is returned to the foundation it goes back to the endowment fund. Attorney Comer advised the council that they have the choice to send the funds back to the foundation and put in the endowment fund or keep the check and spent on the council choices. Council Member Smith made the motion to revoke her motion made at the April meeting and to keep the money and put in the county general fund seconded by Council Member Nickell. Motion approved by (5) members Smith, Nickell, Dunbar, Simon & Dramann and (2) opposed (Bauer & Armbrecht). Council Member Armbrecht made the motion to do an additional of $1,000 from the county general to New Horizons for Impressive Dogwood Horse Ranch/Reward Riding Program seconded by Council Member Simon. Motion approved unanimously. Council Member Smith made the motion to approve the additional appropriation of $272,000 from First Responder Communication Equipment Grant/Ripley County Civil Defense/Emergency Management/Jerry Fry Director seconded by Council Member Dramann. Motion approved unanimously. Council Member Smith made the motion to approve the additional appropriation of $2,500 from the IU Automotive Safety Program Grant/ Car Seats/Scott Melling/EMS Director seconded by Council Member Simon. Motion approved by (5) council members Smith, Simon, Bauer, Dunbar & Nickell and (2) opposed Dramann & Armbrecht. Council Member Smith made the motion to approve the additional appropriation of $33,559.71 from the Drug Free Fund/Sandy Day Howard, Coordinator Ripley County LCC to support spring grant round seconded by Council Member Dramann. Motion approved unanimously. Council Member Simon made the motion to approve the transfer of $429 from Fund #203-43100-000-033 Equipment to Fund 201-43100-000-027 Equipment/County Highway Department seconded by Council Member Smith. Motion approved unanimously. Council Member Smith made the motion to approve the transfer of $221.86 from Fund #100-37800-000-018 Contractual Services to Fund # 288-36104-000-288 Cumulative Jail Fund/County Commissioners seconded by Council Member Simon. Motion approved unanimously. Council Member Simon made the motion to approve the transfer of $2,440 from Fund #100-39800-000-018 Patients in Institutions to Fund # 100-39801-000-018 Secure Detention/County Commissioners seconded by Council Member Armbrecht. Motion approved unanimously. Council Member Nickell made the motion to approve the transfer of $3,000 from Fund #100-37800-000-018 Contractual Services to Fund # 100-44800-000-018 Computer Replacement/County General/County Commissioner seconded by Council Member Simon. Motion approved unanimously. Council Member Armbrecht made the motion to take the $3,000 County General Transfer for Computer Replacements off the record seconded by Council Member Nickell. Motion approved unanimously. Council Member Armbrecht made the motion to approve the Enhanced 911Emergency System /Amended Salary Ordiance seconded by Council Member Bauer. Motion approved unanimously. Council Member Smith made the motion to approve the budget for Ripley County EMS/Automotive Safety Program Grant seconded by Council Member Simon. Motion approved by (5) council members Simon, Smith, Dunbar, Nickell & Bauer and opposed by (2) council members Armbrecht & Dramann. Council Member Armbrecht suggested that the council look at the $95,000 Wagering Money at the June meeting. Economic Development/Chuck Folz presented a copy of guidelines for tax abatement from Pam Sander/Economic Development Director. Technology Committee/Edward Armbrecht reported that Kelly is working on hooking up the new computer. 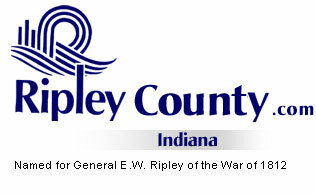 Solid Waste District Committee/Donald Dunbar/meeting Thursday, May 20th, 2004 .
the June 15th, 2004 @ 7:00 PM in the Ripley County Annex seconded by Council Member Simon. Motion approved unanimously.